USS CORAL SEA was the third MIDWAY - class aircraft carrier and the third ship in the Navy named in commemeration of the historic Battle of the Coral Sea fought in May 1942. The first CORAL SEA was CVE 57 which was later renamed ANZIO. 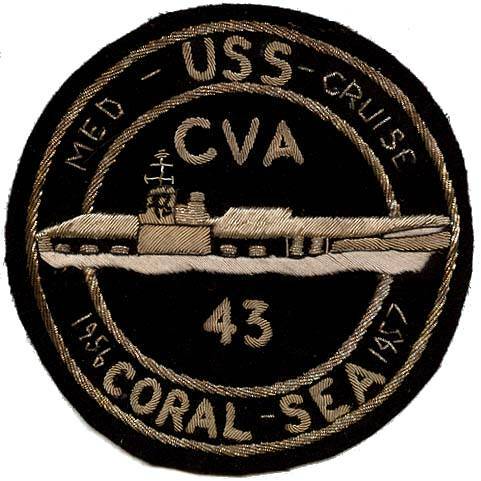 The second CORAL SEA was CV 43's sister ship FRANKLIN D. ROOSEVELT which was originally named CORAL SEA. The ship was renamed after launching on May 8, 1945. 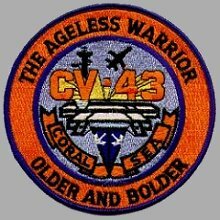 Commissioned as CVB 43, the CORAL SEA was redesignated as attack aircraft carrier CVA 43 on October 1, 1952, and multi-purpose aircraft carrier CV 43 on June 30, 1975. 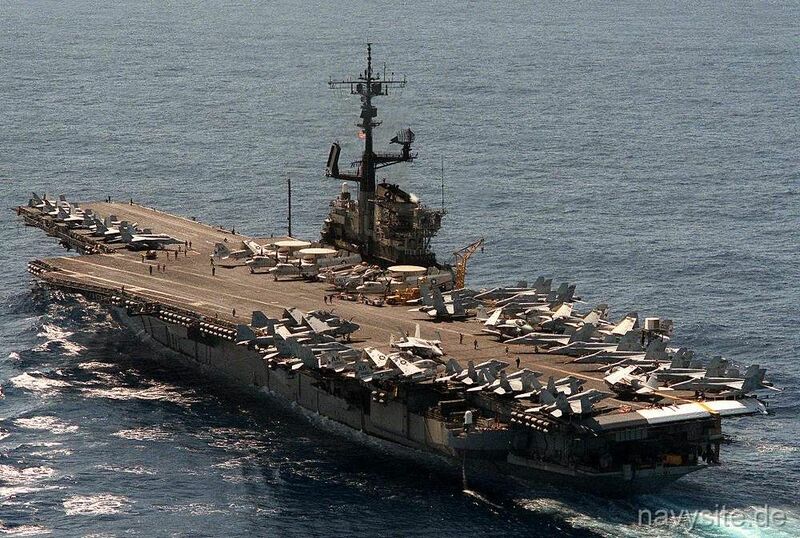 The USS CORAL SEA was decommissioned and stricken from the Navy list on April 30, 1990, after more than 42 years of service. 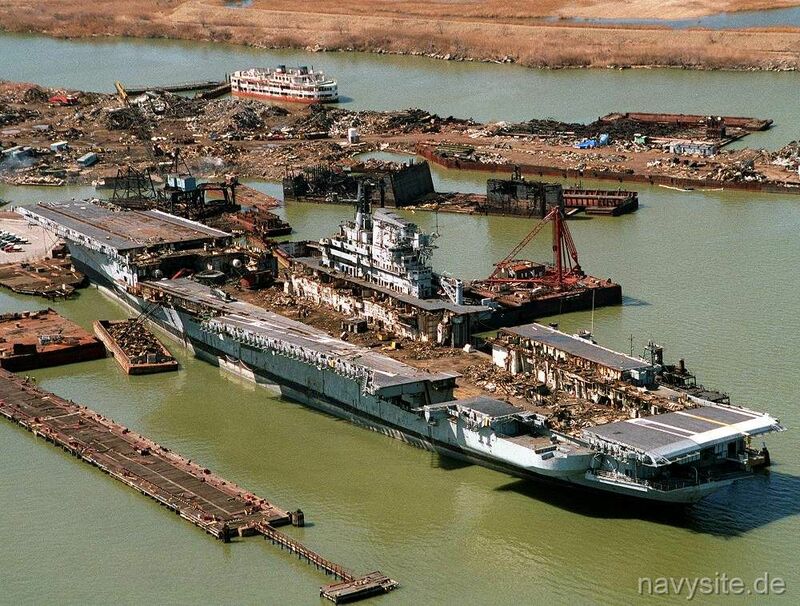 The ship was sold for scrap on May 7, 1993, making the CORAL SEA the largest warship ever scrapped. Builder: Newport News Shipbuilding, Newport News, Va. This section contains the names of sailors who served aboard USS CORAL SEA. It is no official listing but contains the names of sailors who submitted their information. 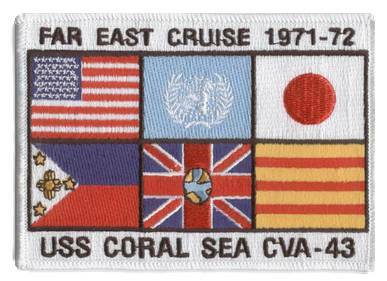 Click here to see which USS CORAL SEA memorabilia are currently for sale on ebay. February 2, 1963 Alameda Naval Air Station, Calif. USS CORAL SEA runs aground in heavy fog near the mouth of the Oakland Estuary. The carrier was freed and pulled into deep water after nine hours. It took 10 tugs to free the CORAL SEA which was heading toward her Pier 3 berth at NAS Alameda after a month of maneuvers when she run aground. There were no signs of damage and no one was injured. May 21, 1966 San Diego, Calif. USS CORAL SEA and the USS IWO JIMA (LPH 2) brush briefly in San Diego, Calif., causing slight damage. October 10, 1967 Tonkin Gulf During an underway replenishment the USS CORAL SEA collides with the USS MOUNT KATMAI (AE 16). Both ship suffer damage, no one is injured. October 25, 1967 Tonkin Gulf The USS CORAL SEA suffers a Zuni rocket explosion while operating off Vietnam, injuring nine. August 22, 1969 San Francisco Bay, Calif. USS CORAL SEA collides with a tug and a Navy barge in San Francisco Bay, injuring one barge crewman. November 20, 1978 Puget Sound Naval Shipyard, Bremerton, Wash. USS CORAL SEA suffers a fire of unknown origin while moored at Puget Sound Naval Shipyard, which causes damage to the medical and dental spaces. December 17, 1984 Norfolk Naval Shipyard, Va. USS CORAL SEA suffers a minor engine room fire during overhaul at the Norfolk Naval Shipyard. The fire is extinguished in an hour with three crewmen injured and $6,000 damage to the vessel. April 11, 1985 45 miles southeast of Guantanamo Bay, Cuba USS CORAL SEA collides with the Ecuadorean tanker NAPO during air ops. A 30-foot hole in the carrier's bow is punched in and some radar and communications equipment is damaged. 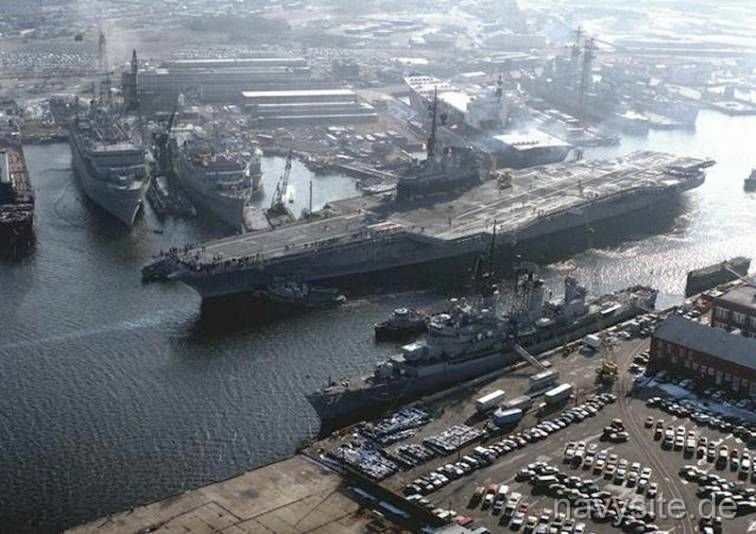 The CORAL SEA returns to drydock in Norfolk Naval Shipyard, Va.
Eleven aircraft airborne at the time of the accident are diverted to Guantanamo Bay. The NAPO is holed above the waterline and spills 7,600 barrels of oil before reaching Guantanamo for repairs. 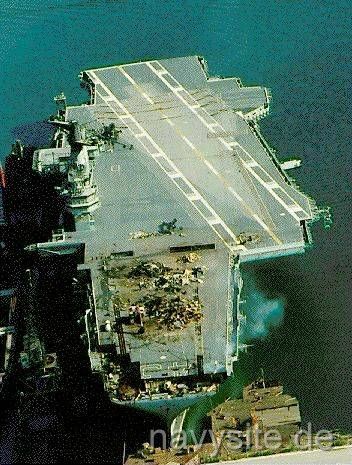 A formal investigation later blames the Commanding Officer of the CORAL SEA for the incident, saying he "used poor judgment in electing to be absent from the bridge during the entire launch and recovery cycle...with a Soviet vessel within 1,500 yards and with other vessels well within" the closest point of approach limits the captain had established. 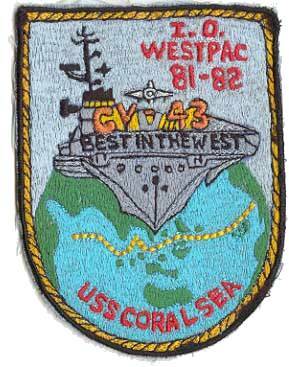 USS CORAL SEA's WestPac Cruise Book from 1981-82 includes a very comprehensive ship's history. Click here to read it. USS CORAL SEA was launched 2 April 1946 by Newport News Shipbuilding and Drydock Co., Newport News, Va., sponsored by Mrs. T. C. Kinkaid, commissioned 1 October 1947, Captain A. P. Storrs, III, in command; and reported to the Atlantic Fleet. The ship began a series of career milestones when, on 27 April 1948, two P2V-2 Neptunes, piloted by Cmdr. Thomas D. Davies and Lt. Cmdr. John P. Wheatley, made JATO take-offs from the carrier as it steamed off the Norfolk, Va. This was the first carrier launchings of planes of this size and weight. 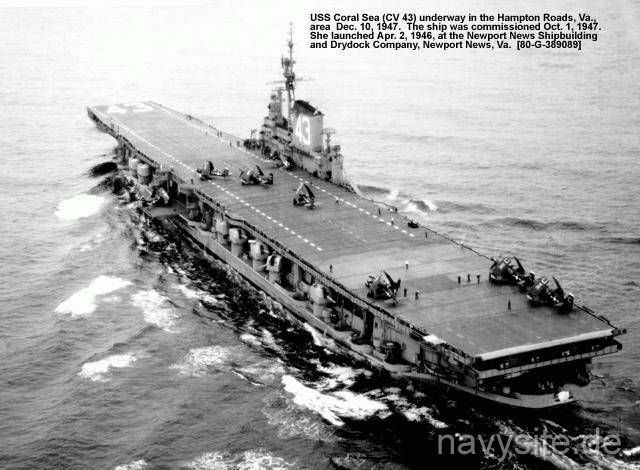 USS CORAL SEA sailed from Norfolk 7 June 1948 for a midshipmen cruise to the Mediterranean and Caribbean, and returned to Norfolk 11 August. After an overhaul period, USS CORAL SEA was again operating off the Virginia Capes. On 7 March 1949, a P2V-3C Neptune, piloted by Capt. John T. Hayward of VC 5, was launched from the carrier with a 10,000-load of dummy bombs. The aircraft flew across the continent, dropped its load on the west coast, and returned nonstop to land at the Naval Air Station, Patuxent River, Md. Following training in the Caribbean, USS CORAL SEA sailed 3 May 1949 for her first tour of duty in the Mediterranean with the 6th Fleet, returning 28 September. On 21 April 1950, the first carrier take-off of an AJ-1 Savage heavy attack bomber was made from USS CORAL SEA by Capt. John T. Hayward of VC 5. The remainder of the pilots of the squadron completed carrier qualifications on board USS CORAL SEA in this aircraft on 31 August, marking the introduction of this long-range attack bomber to carrier operations. At this time, USS CORAL SEA returned to the Mediterranean for duty from 9 September 1950 to 1 February 1951, bringing her impressive strength to the 6th Fleet in its important role as guardian of peace in the Mediterranean. 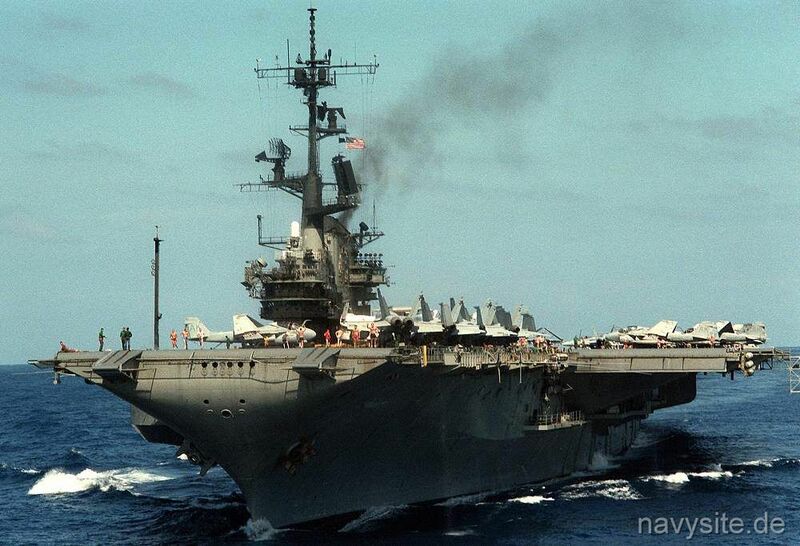 USS CORAL SEA trained pilots in carrier operations off the Virginia Capes and Mayport, Fla., and in April 1953 she embarked the Judiciary Committee of the House of Representatives for a three-day cruise. On 26 April, the carrier sailed for a tour of duty in the Mediterranean. This cruise was highlighted by a visit to Spain, and participation in NATO Exercise Black Wave with Deputy Secretary of Defense R. M. Kyes on board as an observer. Returning to Norfolk 21 October, she carried out tests for the Bureau of Aeronautics and trained members of the Naval Reserve at Mayport, Fla., and Guantanamo Bay. USS CORAL SEA returned to the Mediterranean from 7 July to 20 December 1954, and during this tour was visited by Generalissimo Franco as she lay off Valencia, Spain. On her next tour of duty in the Mediterranean from 23 March to 29 September 1955, she called at Istanbul, and participated in NATO exercises. 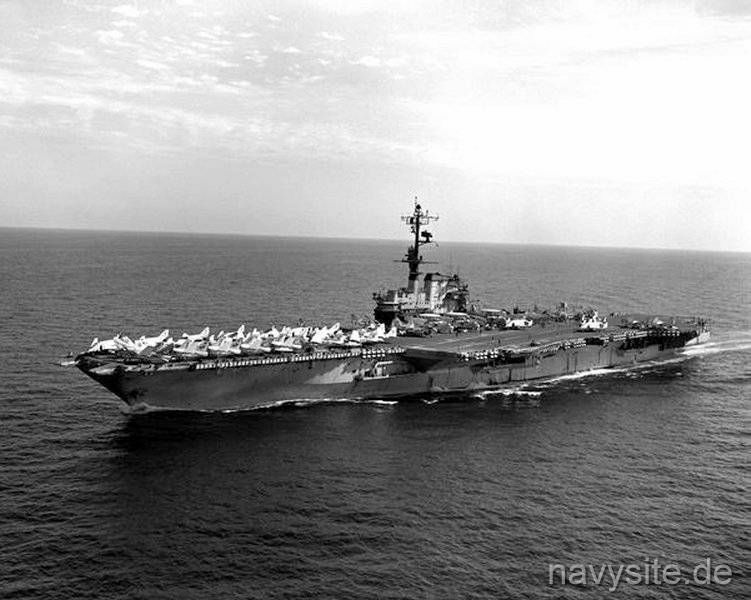 Sailing from Norfolk 23 July 1956 for Mayport to embark Carrier Air Group 10, USS CORAL SEA continued on to the Mediterranean on her next tour. She participated in NATO exercises, and received the King and Queen of Greece on board as visitors in October. During the Suez Crisis, she evacuated American citizens from the troubled area, and stood by off Egypt until November. She returned to Norfolk 11 February 1957. She cleared that port on 26 February and visited Santos, Brazil; Valparaiso, Chile; an d Balboa, C.Z., before arriving at Bremerton, Wash., 15 April. USS CORAL SEA was decommissioned for conversion 24 May 1957, and upon completion was recommissioned 25 January 1960 to rejoin the Fleet. During September 1960, she conducted training with her new air group along the west coast, then sailed in September for a tour of duty with the 7th Fleet in the Far East. 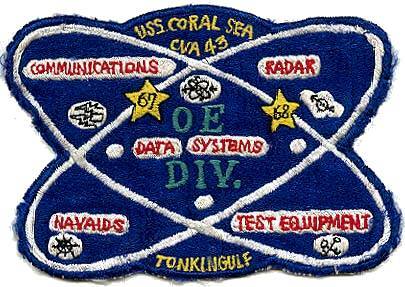 Installation of the Pilot Landing Aid Television (PLAT) system was completed on USS CORAL SEA on 14 December 1961. She was the first carrier to have this system installed for operations use. Designed to provide a videotape of every landing, the system proved useful for instructional purposes and in the analysis of landing accidents, thereby making it an invaluable tool in the promotion of safety. By 1963, all attack carriers had been equipped with PLAT and plans were underway for installation in the CVSs and at shore stations. 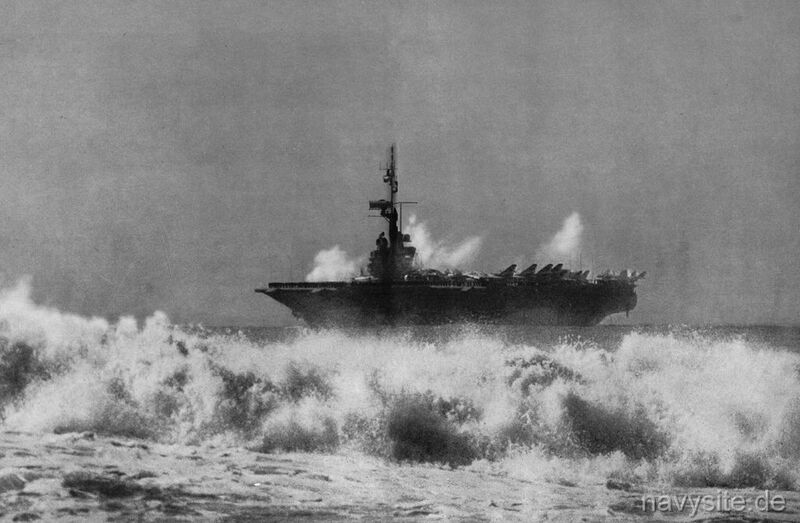 Following the Gulf of Tonkin incident in August, USS CORAL SEA departed on 7 December 1964 for duty with the U.S. Seventh Fleet. 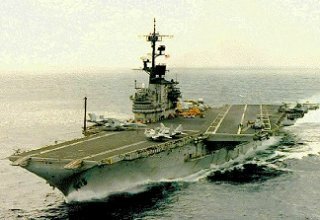 On 7 February 1965, aircraft from USS CORAL SEA, along with those from USS RANGER (CVA 61) and USS HANCOCK (CVA 19), blasted the military barracks and staging areas near Dong Hoi in the southern sector of North Vietnam. The raids were in retaliation for a damaging Viet Cong attack on installations around Pleiku in South Vietnam. On 26 March, the Seventh Fleet units began their participation in Operation Rolling Thunder, a systematic bombing of military targets throughout North Vietnam. Pilots from USS CORAL SEA struck island and coastal radar stations in the vicinity of Vihn Son. 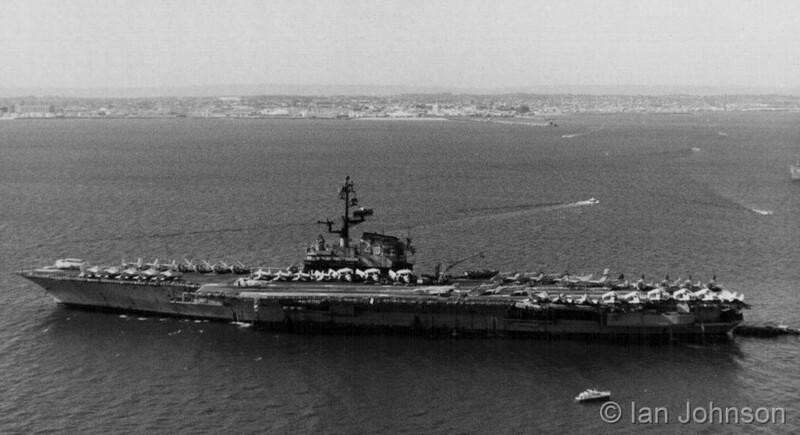 USS CORAL SEA remained on deployment until returning home on 1 November 1965. 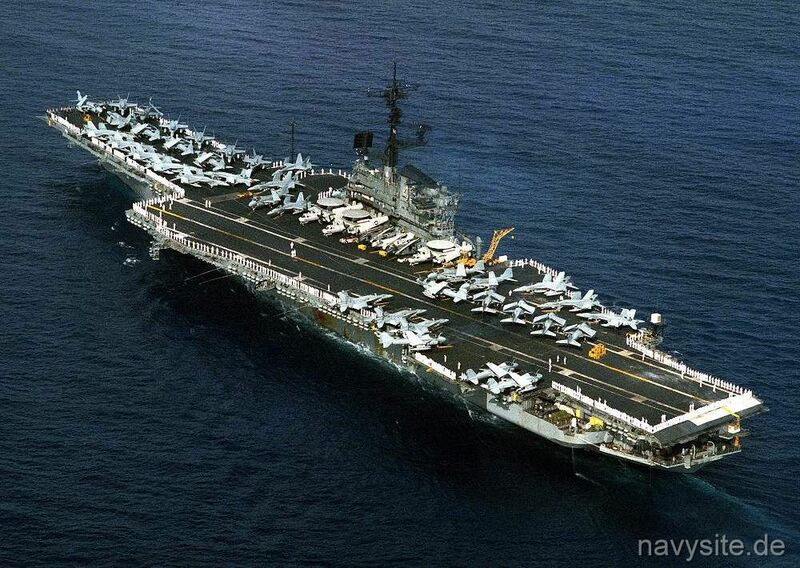 USS CORAL SEA continued WestPac/Vietnam deployments until 1975. She deployed from 29 July 1966 to 23 February 1967; 26 July 1967 to 6 April 1968; 7 September 1968 to 15 April 1969; 23 September 1969 to 1 July 1970; 12 November 1971 to 17 July 1972; 9 March 1973 to 8 November; and from 5 December 1974 to 2 July 1975. Operations by Navy and Marine Corps aircraft in Vietnam expanded significantly throughout April 1972 with a total of 4,833 Navy sorties in the south and 1,250 in the north. 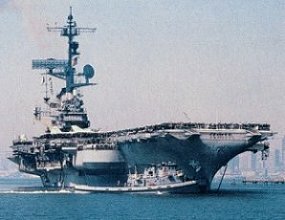 USS CORAL SEA, along with HANCOCK, was on Yankee Station when the North Vietnamese spring offensive began. 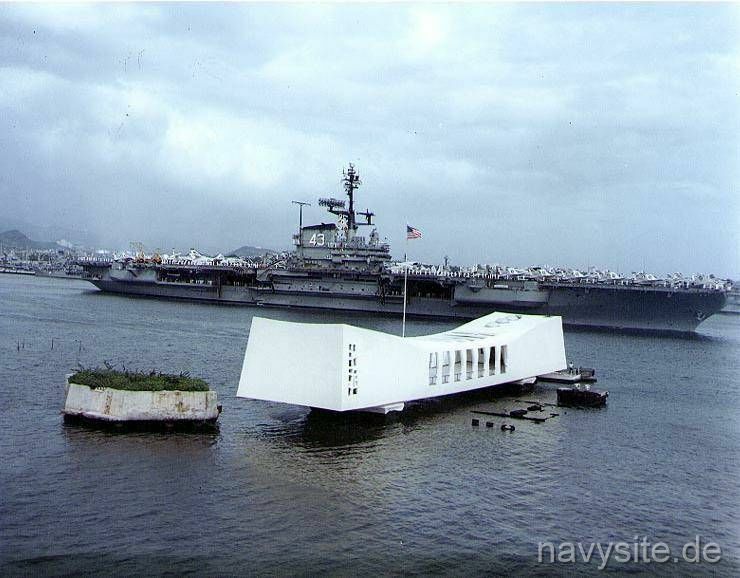 They were joined in early April by USS KITTY HAWK (CV 63) and USS CONSTELLATION (CV 64). 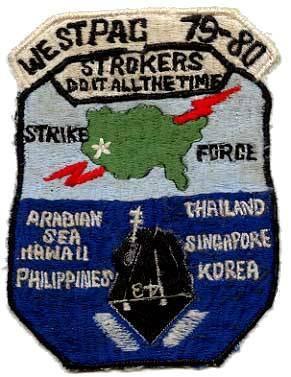 On 16 April 1972, aircraft from USS CORAL SEA, along with those from KITTY HAWK and CONSTELLATION, flew 57 sorties in the Haiphong area in support of U.S. Air Force B-52 strikes on the Haiphong petroleum products storage area in an operation known as Freedom Porch. Operation Pocket Money, the mining campaign against principal North Vietnamese ports, was launched 9 May 1972. Early that morning, an EC-121 aircraft took off from Da Nang airfield to provide support for the mining operation. A short time later, KITTY HAWK launched 17 ordnance-delivering sorties against the Nam Dinh railroad siding as a diversionary air tactic. Poor weather, however, forced the planes to divert to secondary targets at Thanh and Phu Qui which were struck at 090840H and 090845H, Vietnam time, respectively. USS CORAL SEA launched three A-6A and six A-7E aircraft loaded with mines and one EKA-3B in support of the mining operation directed against the outer approaches to Haiphong Harbor. The mining aircraft departed the vicinity of USS CORAL SEA at 090840H in order to execute the mining at precisely 090900H to coincide with the President Richard M. Nixon's public announcement in Washington that mines had been seeded. The A-6 flight led by the CAG, Cmdr. Roger E. Sheets, was composed of Marine Corps aircraft from VMA-224 and headed for the inner channel. The A-7Es, led by Cmdr. Leonard E. Giuliani and made up of aircraft from VA-94 and VA-22, were designated to mine the outer segment of the channel. Each aircraft carried four MK 52-2 mines. Capt. William R. Carr, USMC, the bombardier/navigator in the lead plane, established the critical attack azimuth and timed the mine releases. The first mine was dropped at 090859H and the last of the field of 36 mines at 090901H. Twelve mines were placed in the inner segment and the remaining 24 in the outer segment. All MK 52-2 mines were set with 72-hour arming delays, thus permitting merchant ships time for departure or a change in destination consistent with the President's public warning. It was the beginning of a mining campaign that planted over 11,000 MK 36 type destructor and 108 special MK 52-2 mines over the next eight months. It is considered to have played a significant role in bringing about an eventual peace arrangement, particularly since it so hampered the enemy's ability to continue receiving war supplies. The Paris Peace Accords, ending hostilities in Vietnam, were signed 27 January 1973, ending four years of talks. North Vietnam released nearly 600 U.S. prisoners by 1 April, and the last U.S. combat troops departed Vietnam on 11 August. However, the war was not over for the Vietnamese. By spring 1975, the North was advancing on the South. USS CORAL SEA, USS MIDWAY (CVA 41), HANCOCK, USS ENTERPRISE (CVAN 65) and USS OKINAWA (LPH 3) responded 19 April 1975 to the waters off South Vietnam when North Vietnam overran two-thirds of South Vietnam. Ten days later, Operation Frequent Wind was carried out by U.S. Seventh Fleet forces. Hundreds of U.S. personnel and Vietnamese were evacuated to waiting ships after the fall of Saigon to the North Vietnamese. South Vietnam officially surrendered to the North on 30 April. On 12 to 14 May 1975, USS CORAL SEA participated with other Navy, Air Force, and Marine Corps forces in the recovery of the U.S. merchant ship SS Mayaguez and her 39 crew, illegally seized on 12 May in international waters by a Cambodian gunboat controlled by the Communist Khmer Rouge. Protective air strikes flown from the carrier against the Cambodian mainland naval and air installations as Air Force helicopters with 288 Marines from Battalion Landing Teams 2 and 9 were launched from Utapao, Thailand, and landed at Koh Tang Island to rescue the Mayaguez crew and secure the ship. Eighteen Marines, Airman, and Navy corpsmen were lost in the action. 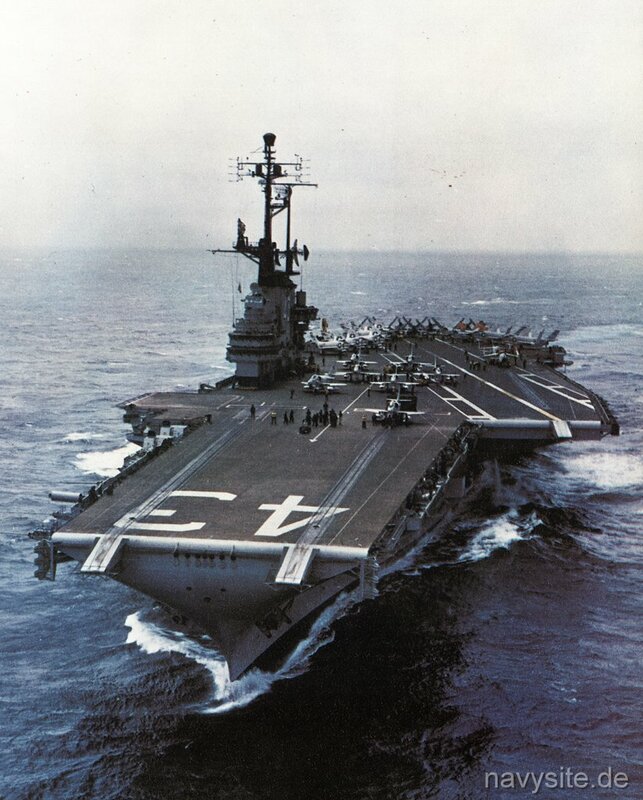 For her action, USS CORAL SEA was presented the Meritorious Unit Commendation on 6 July 1976. 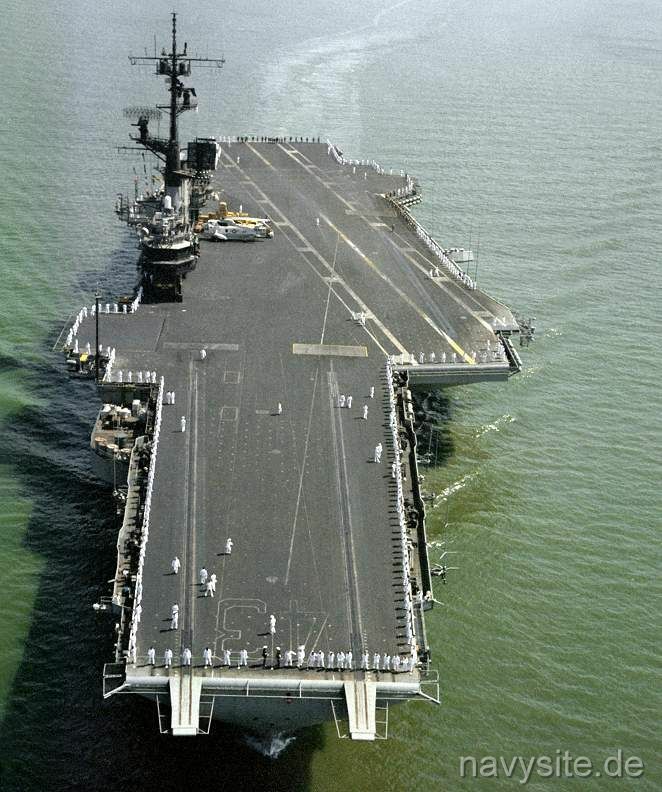 USS CORAL SEA relieved MIDWAY in the northern part of the Arabian Sea on 5 February 1980 in connection with the continuing hostage crisis in Iran. Militant followers of the Ayatollah Khomeini, who had come to power following the overthrow of the Shah, seized the U.S. Embassy in Tehran on 4 November 1979 and held 63 U.S. citizens hostage. The hostage crisis ended on 20 January 1981 when Ronald Reagan succeeded Jimmy Carter as President of the United States and Iran released the U.S. citizens. 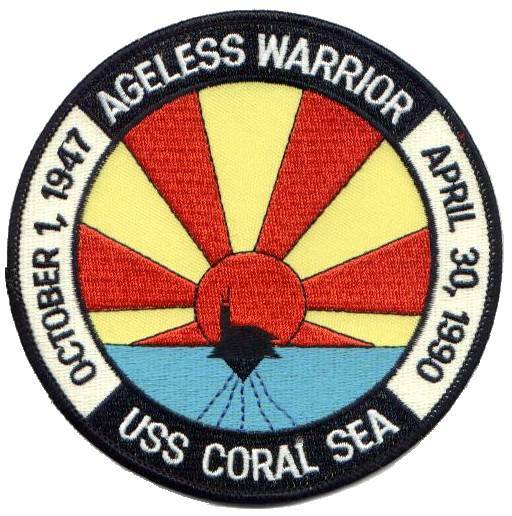 On 13 October 1985, USS CORAL SEA returned to the Mediterranean Sea for her first Sixth Fleet deployment since 1957. Commanded by Capt. Robert H. Ferguson, with CVW-13 embarked, it was also the first deployment of the new F/A-18 Hornet to the Mediterranean. The Hornets were assigned to VFA-131 and VFA-132 in USS CORAL SEA. On 24 March 1986, Libyan armed forces fired missiles at U.S. naval forces operating in the Gulf of Sidra after declaring international waters as their own. U.S. retaliation was swift and deadly. Additionally, F/A-18 Hornets from USS CORAL SEA and A-7E Corsairs from USS AMERICA (CV 66) conducted air-to-surface Shrike and HARM missile strikes against Libyan surface-to-air missile sites at Benghazi and Tripoli on 14 and 15 April. 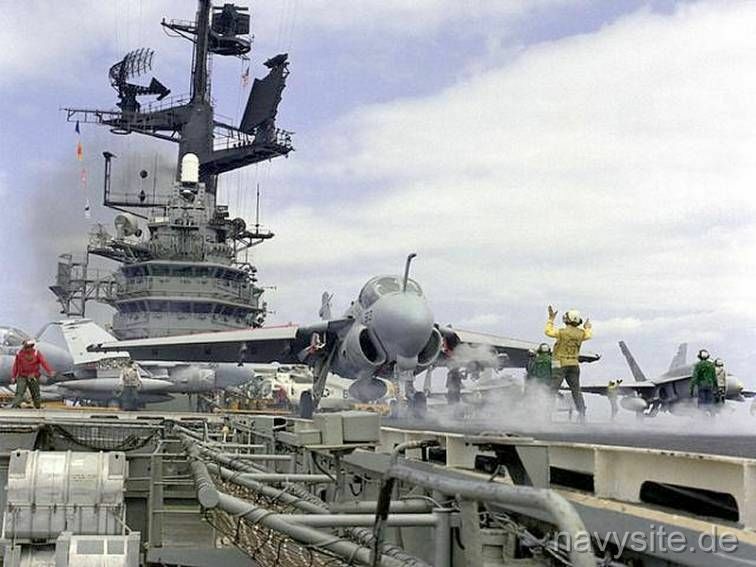 USS CORAL SEA continued deployments to the Mediterranean Sea and Indian Ocean area throughout the remainder of the 1980s and into the 1990s. In 1987, she developed the "CORAL SEA configuration" in which to help streamline aircraft maintenance, two attack squadrons on board used a shared maintenance. On 19 April 1989, while operating in the Caribbean, USS CORAL SEA responded to a call for assistance from USS IOWA (BB 61) due to an explosion in the battleship's number two gun turret in which 47 crew members were killed. The explosive ordnance disposal team from USS CORAL SEA removed volatile powder charges from the ship's 16-inch guns and flooded powder magazines. USS CORAL SEA also dispatched a surgical team and medical supplies. HC-8, using SH-3G helicopters, also performed medevac and logistical support to IOWA. 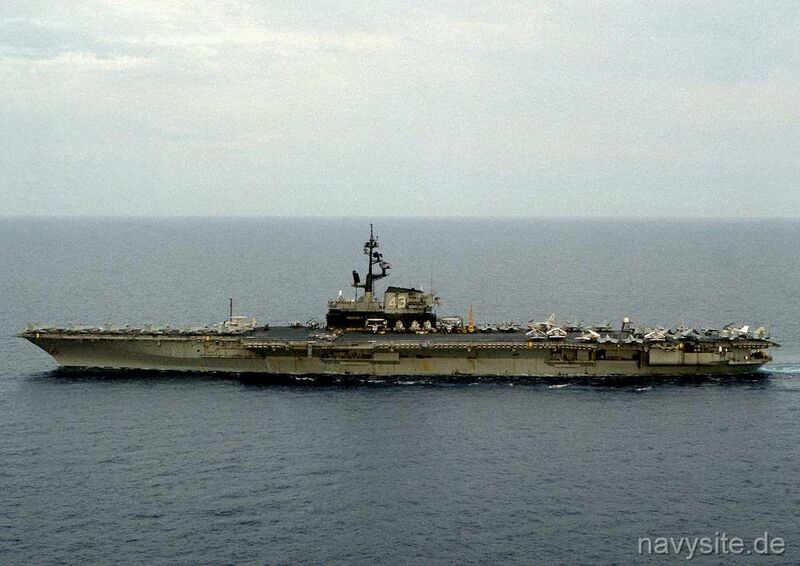 USS CORAL SEA was decommissioned 26 April 1990. Stricken from the Navy List, she was sold by the Defense Reutilization and Marketing Service (DRMS) for scrapping on 7 May 1993. 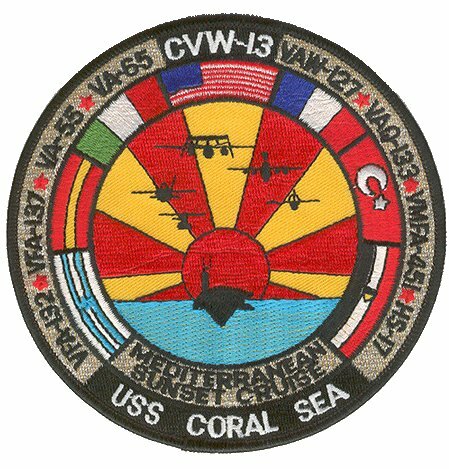 Click here to view more USS CORAL SEA Patches. The photo below was taken by Ian Johnson and shows USS CORAL SEA anchored in Gage Roads, Fremantle, Australia, on June 1, 1975. 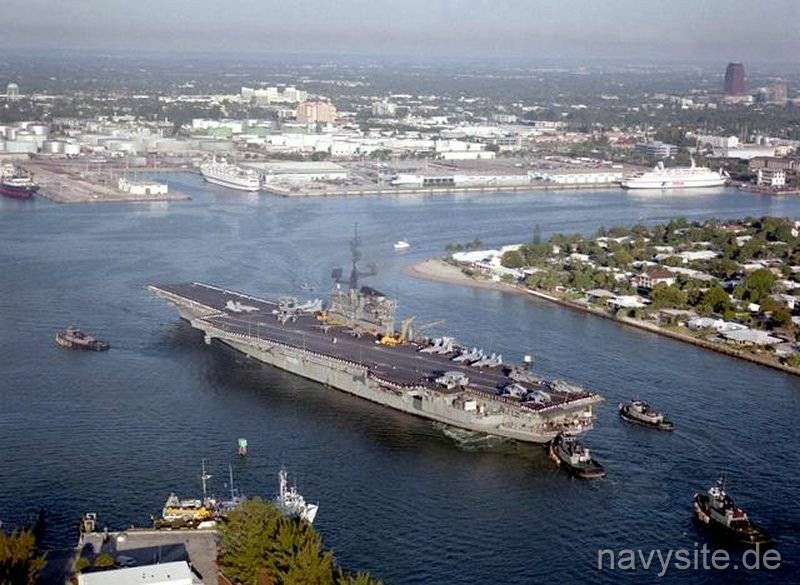 This was the first liberty visit of a US Navy "super carrier" to Western Australia. Back to Carriers list. Back to ships list. Back to selection page. Back to 1st page.